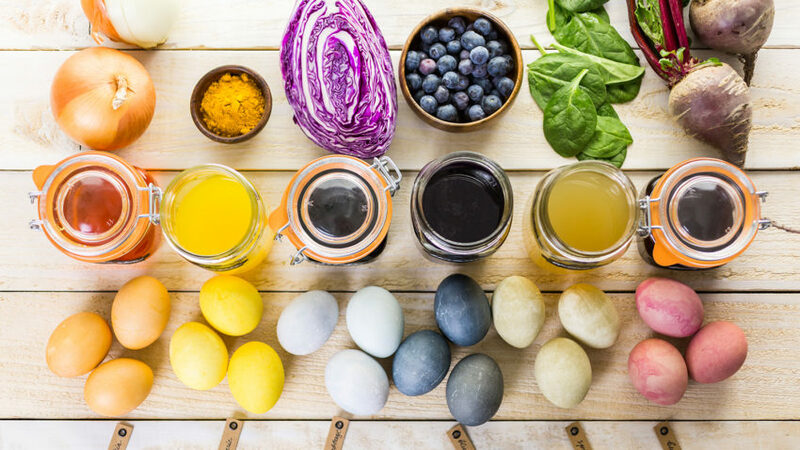 Make your own all-natural egg dyes using food scraps. This allows you to skip the synthetic food coloring and use items you already have on hand! They’re most effective when eggs are soaked in color overnight in the refrigerator, especially when using brown eggs. For every dozen eggs, plan on using at least 4 cups of dye liquid. Boil 2 cups of water with peels of 3-5 yellow onions. Boil on medium heat for 15 minutes. Strain and add 2 tsp. white vinegar. Add 2 Tbsp. turmeric to 1 cup water. Stir and add 2 Tbsp. white vinegar. Boil a pot of water with 1 head of chopped red cabbage. Boil on medium heat for 20-30 minutes. Strain and add 1 Tbsp. white vinegar. Boil 2 cups of water with 2 cups of chopped beets. Boil on medium heat for 15 minutes. Strain and add 2 tsp. white vinegar.